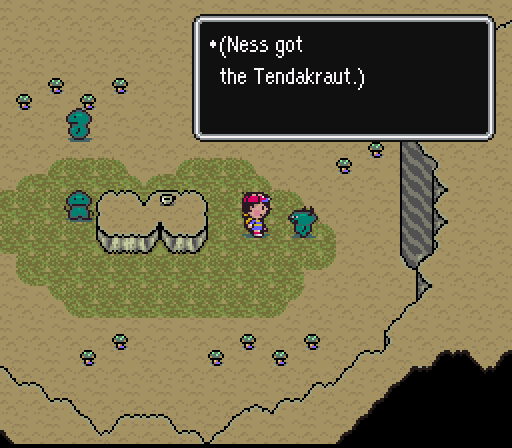 We teleported to the grassy knoll just outside of the entrance to the strange Tenda's cavernous village. 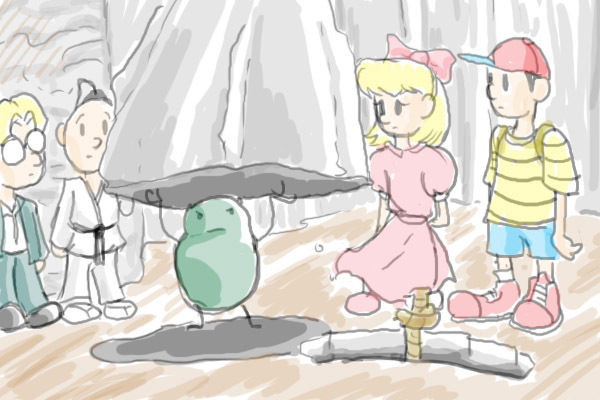 Stepping into the cool, mossy cave, we saw all the little green fellows looking shyly at their feet once again. Our footsteps echoing in the quiet cave, we made our way towards the back, where the only Tenda not afflicted by their overwhelming shyness was. 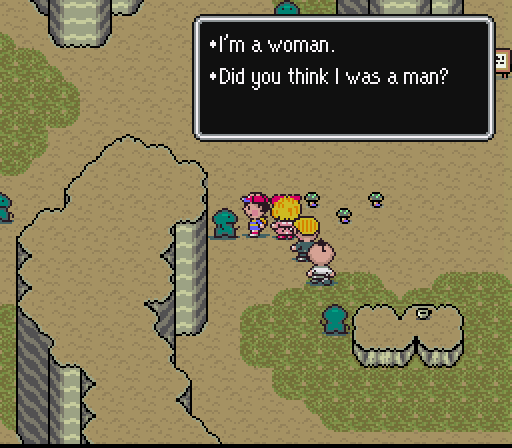 We recognized him right away, as he spoke up and greeted us. : "Hey, it's you guys again. What's the good word, chief?" : "We have a book we think might help the tribe overcome its shyness. 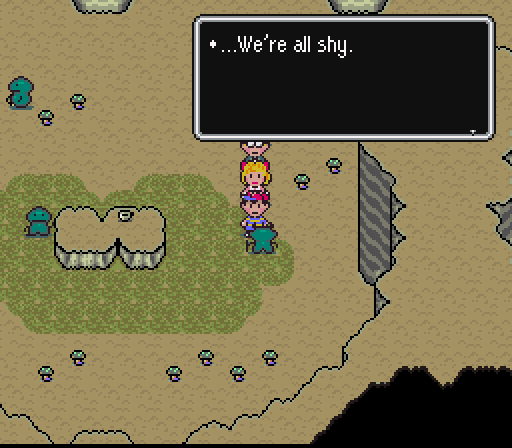 It's called 'Overcoming Shyness'." 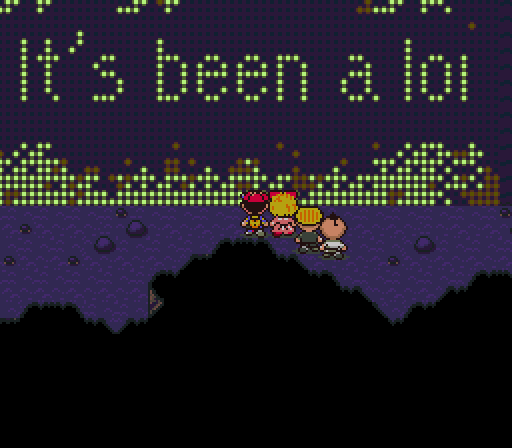 : "Hey, that's great, bubby! Let's go see the chief, he'll want to hear about this." 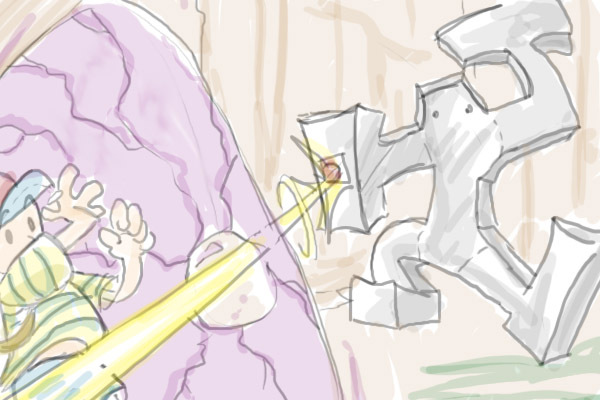 He led us over to a large, stone table, where a slightly taller Tenda with a large scepter was standing at the head. I unzipped my backpack and brought out the book. I gave it to the Tenda chieftan, and his small, beady eyes immediately lit up. : "Book! Can fix shyness. Thanks. Relax. I'll read to everyone. Oh! Just holding this book in my hands makes me feel like I'm overcoming my shyness already!" : "Good. Um, we're just going to rest...do you have a hotel here, or anything like that?" 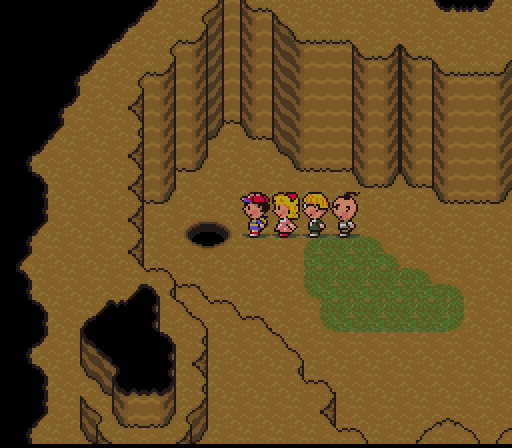 : "Well, it's something of a hole in the wall...But it's to the left over there." The Tenda chief was calling all of the Tendas over to him as we headed for the hotel, which was certainly a hole in the wall. : "Aw, man. 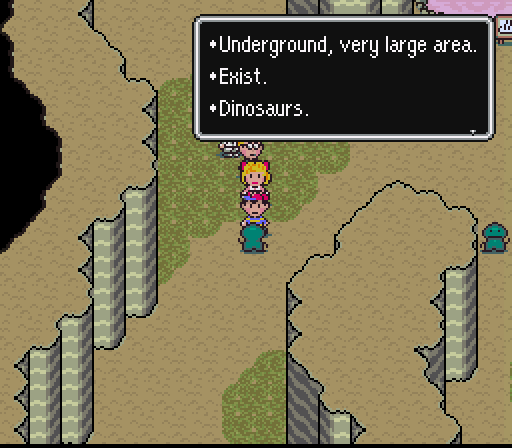 It's just an empty cave. : "Oh well. I guess we have to take what we can get." We sat on the cool, hard floor and eventually nodded off to sleep. In the morning, we woke up to the buzz of conversation. It seemed the book had worked, as little groups of Tenda had gathered and were chatting happily with each other. We approached the chief, Tendas waving at us all the while. : "So the book helped, I guess." : "Oh, yes! Everyone has overcome their shyness now. We're all talking and making new friends. And we have you to thank! 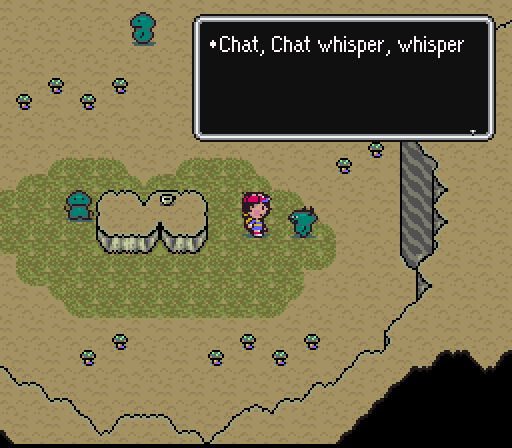 Come on, go talk to some of the Tendas you helped out!" 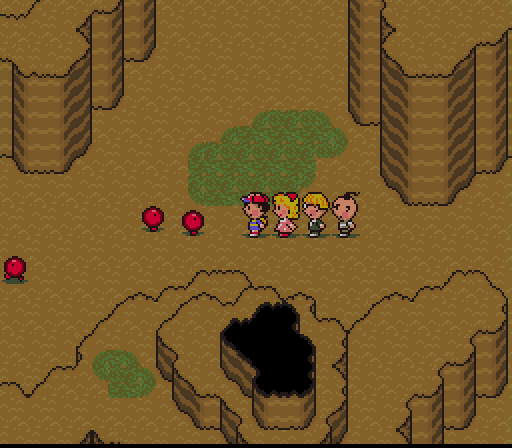 And so, we strolled about the cave, listening to the Tendas new-found social interactions. : "Big. Scary. 'Lost Underworld.' Stone. There is. Talks lots." : "Ah, that's too bad. At least you'll have lots of friends to talk to." Back at the chief's table, a cheerful Tenda approached us with a steaming teacup on a saucer. : "As a show of thanks, would you like to have a drink of Tenda tea?" 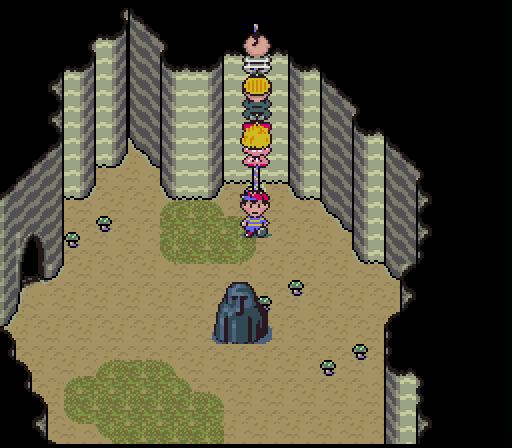 I hesitated for a moment, remembering the 'coffee' I had back in Saturn Valley, but the little guy was just too cute. I didn't want to offend the Tendas, so I took a deep sip of the warm tea. I thought surely it couldn't be the same as before, right? Some time later, I felt myself being shaken awake by Paula. : "Ugh, my head. What the...Oh, man, I am never taking another food or drink from anybody ever again." The Tenda chief walked up to us, laughing. : "Heh, heh. Our tea is not usually drank by outsiders, you see. It can be...disorienting. Anyway, I know that you are headed for the 'Lost Underworld', but before you go, I want to give you this." He held out a large stone bowl, full of what looked like sauerkraut, with an incredibly rank smell wafting off of it. : "This is Tendakraut, a traditional dish of the Tenda people. It has been handed down from ages past as a sign of friendship. As thanks for helping the Tenda tribe, please take it. From this moment on, all Tendas are your friends!" : "It stinks, but it tastes wonderful." : "Really? Let's try some." : "No! Paula, get away from it!" 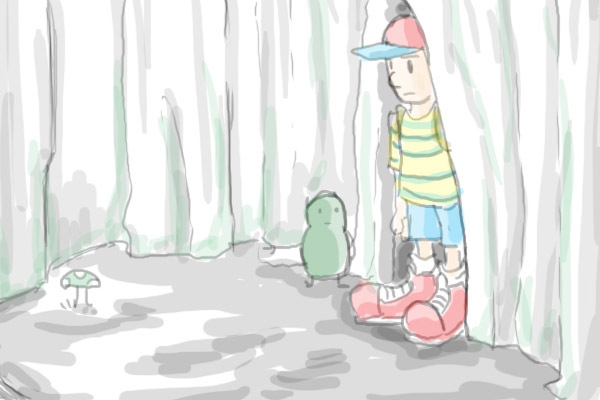 : "Ness, what's wrong with you?" The Tenda chief was looking confused at me. I didn't want to upset them. : "Thank you, sir. We've got to run now. Goodbye!" I led my friends around the corner, waving cheerfully at the Tenda chief. : "Are you kidding? After the coffee? The tea just now? The magic cake?! Who knows what's gonna happen if we eat this? No. No way." Digging in my backpack, I found an old thermos that used to have some lemonade in it. I poured the Tendakraut inside and sealed the lid tight. : "It doesn't even block the smell. Ugh." We walked up to the big rock at the back of the cave. Next to it, a Tenda was flexing his thin, stick-like arms. : "Say, are you the strongest of the Tendas? Can you lift this rock for us?" He hoisted the huge boulder over his head...somehow, and slammed it to the ground off to the side, revealing a rope leading down a deep, dark hole. We clapped politely for the powerful Tenda, who was bowing and flexing his muscles. Then we climbed down the rope into the darkness below. 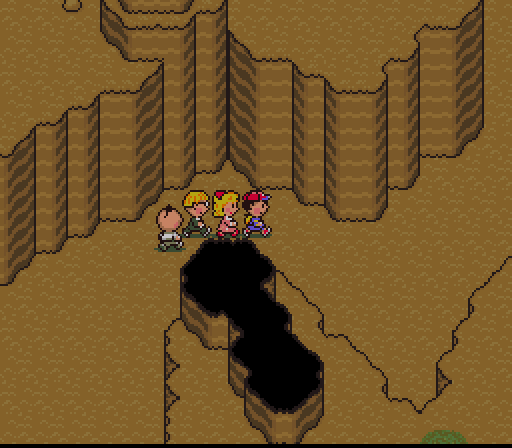 We found ourselves in a small cave dotted with mushrooms. A large, black rock jutted from the ground in the center. As we walked up to it, I noticed it almost looked like it had a face carved into its rough, rocky surface. I guess I shouldn't have been surprised, after everything else that had happened on this journey. 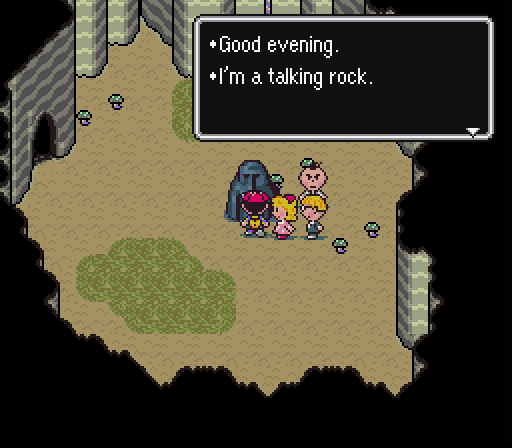 A talking rock really wasn't any stranger than a talking mouse, or a talking pile of vomit, or a talking bee from the future. : "But the rocks around here don't talk too much." : "I don't want to upset you, but most rocks don't talk." : "Well, that's their loss. 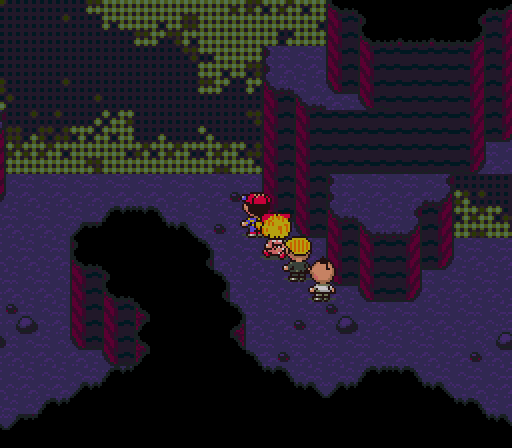 The rock that talks the most is deep down in the labyrinth a ways ahead...in the Lost Underworld. 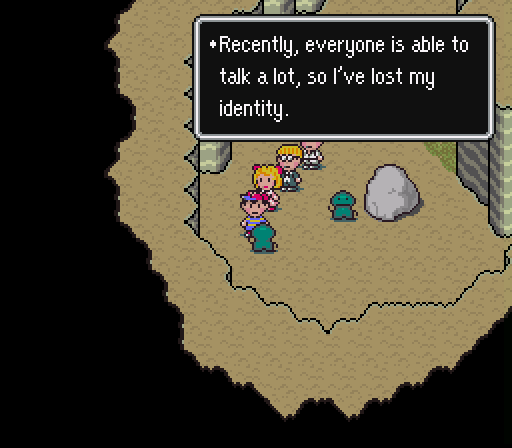 Don't forget to talk to the rock! It's important!" : "Alright, I'll remember that. Talk to the rock. Um, thanks." 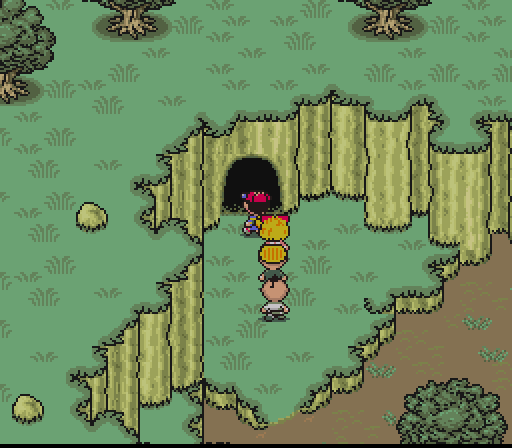 The rock grinned and didn't say anything else, so we continued on through the cave. Immediately we noticed a difference, as the ground here was soft, like soil, and the light was dim. : "Hey, it's those things from Belch's place! 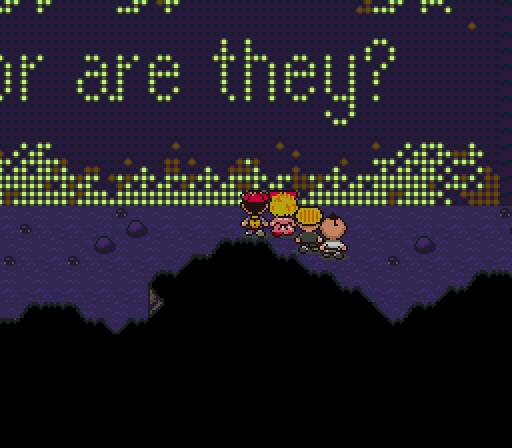 What are they doing here?" : "I would like the opportunity to study one of those more thoroughly, but now's not really the time." 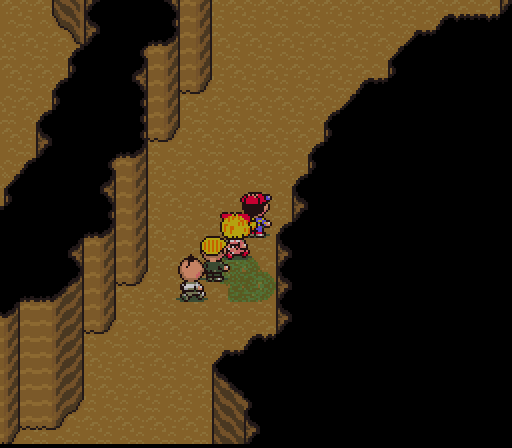 The little red monsters were gibbering and headbutting us in the shins. It was really more irritating than painful, but there were so many of them, we really didn't have much of a choice but to stomp them into goo and keep walking. 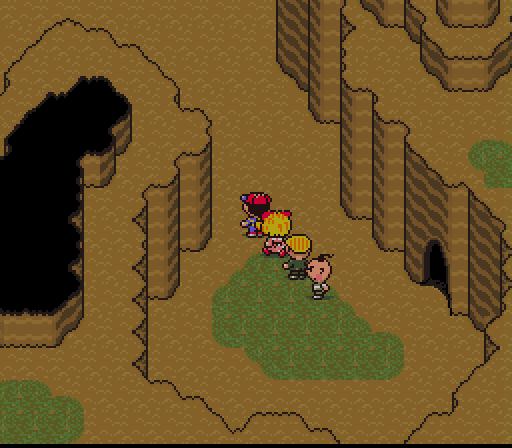 The cave was long and winding, and full of persistant little gobs. 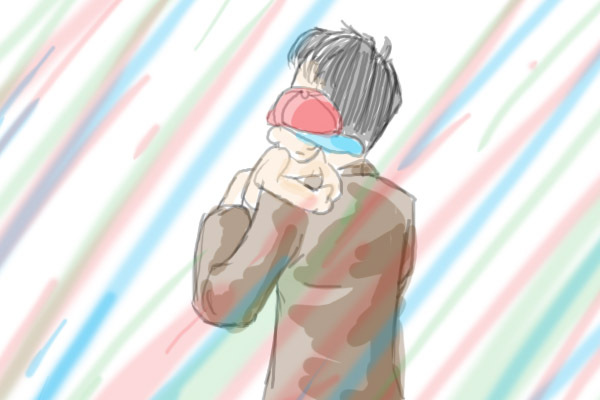 : "...I think we're lost." 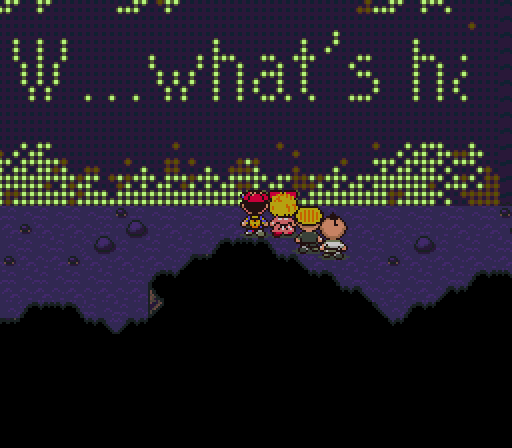 : "No, we came from this way, see the splattered red goo everywhere?" : "Guys! Do you see that? 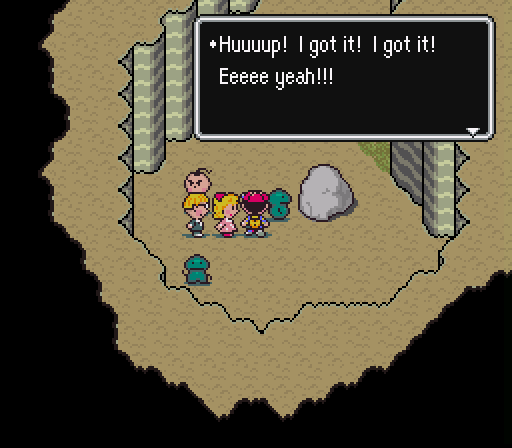 It's another rock with a face on it!" : "Wow, I guess there really are a few talking rocks in the world, huh?" : "Hi. 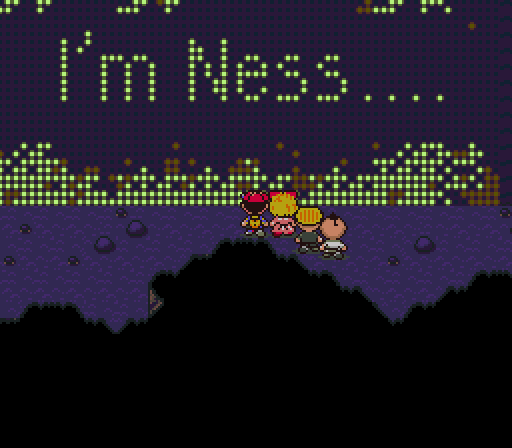 Um, I'm Ness. 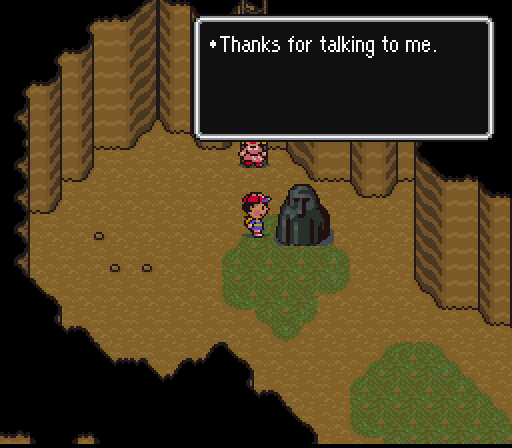 I met another talking rock a little ways back. Are you the rock I'm supposed to talk to?" The rock closed its stone eyes and spoke no more. 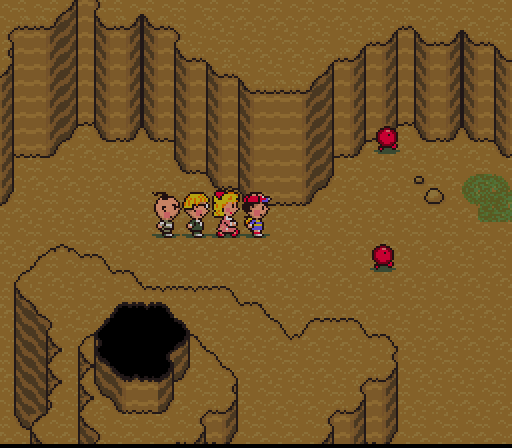 : "*sigh* I guess that wasn't the rock..."
We wandered through the cave for a bit longer, and finally found ourselves before a familiar flickering light. 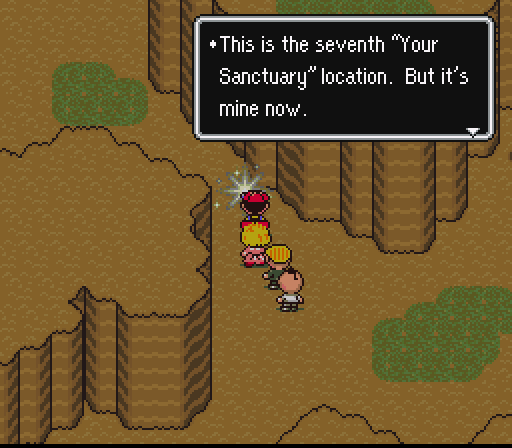 : "A sanctuary location? I wasn't expecting to find this here...Is everyone ready for a battle?" My friends nodded, and a short walk later, we stood before the second-to-last Sanctuary guardian. A horrible metallic screech split the air, and a loud thud from above drew our attention. Loud, clanging footsteps announced the arrival of the Guardian, and we looked around to see what opposition we would face this time. 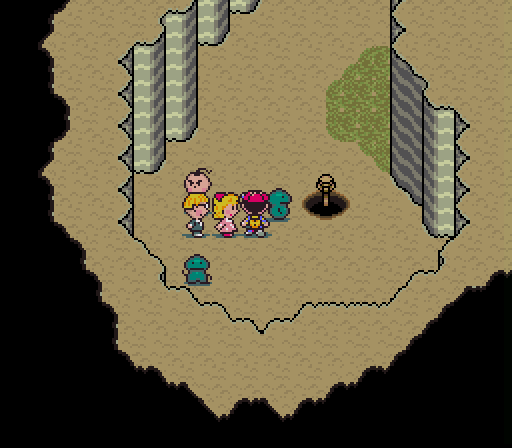 Suddenly, in a cloud of dust, a blocky, angular figure slammed to the ground before us. : "What in the heck is this?!" The weird robot-thing squawked and swung a rectangular arm at us. Shards of rock flew everywhere as it slammed into the rock wall beside us. We scattered and fell back. The screeching being charged us head-on. 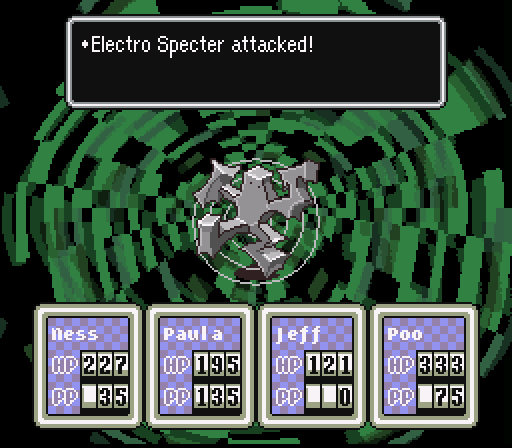 I threw up a quick psychic shield over my friends, and the robot slammed into it. It pounded on the purple wall of energy for a moment, emitting a high whistling screech all the while. Suddenly it aimed its blocky arm at us and a strange beam shot out and pierced my shield, which abruptly shattered in a million pieces and vanished. : "It's a built in psychic neutralizer! Be careful, guys, I don't think shields are going to work on this creature!" So we decided to go on the offensive. I charged the robot with my bat, the beat-up wood smacking off the metal surface with deep clanging noises, leaving small dents here and there. Jeff was leaving black scorch marks and tiny holes in the robot's casing with his ray gun. 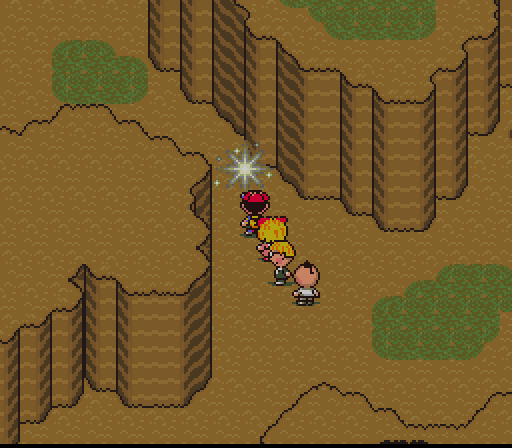 Poo ran up with me and began pummeling the steel creature with punches and kicks. 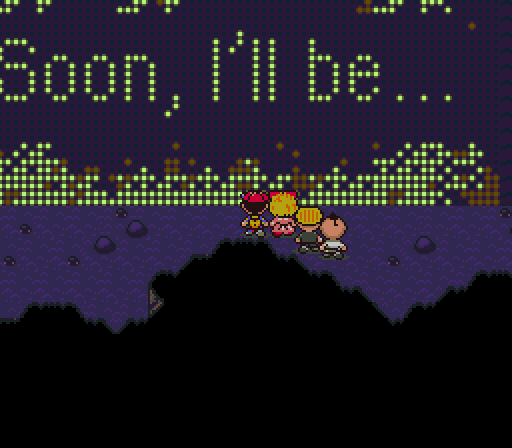 Paula was hanging back, firing off charges of lightning bolts. One of her attacks hit the robot a scant few inches away from my face. : "Hey, Paula, watch the lightning! That one almost took my face off!" 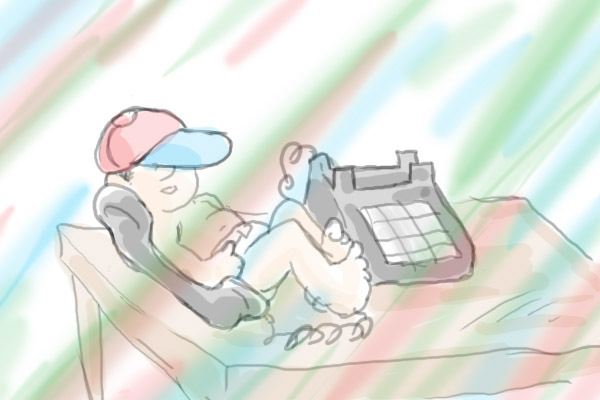 : "Sorry, Ness, it's not as easy to control as it looks!" Suddenly I felt a heavy blow to the back of my head and I was lifted off the ground and sent flying. The robot had seized on my distraction and nailed me with one of its big, rectangular hands. Stars danced before my eyes as I skidded off the ground and hit the rock wall. I watched, upside down, as the robot seemed to laugh. That was its downfall, as Poo took his opportunity to launch a powerful Starstorm attack while the robot's back was turned. With the wounds it had already sustained, the attack was too much for it, and its body burst apart in a rain of sparks. 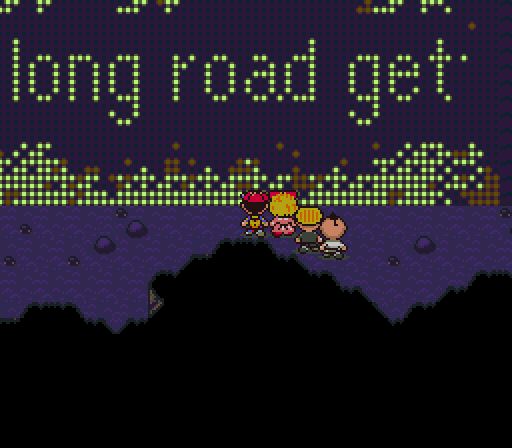 Paula ran over to me. : "Ness! Are you alright! I'm so sorry!" : "The room is still spinning, but I think I'm gonna be all right. Goo...uh, good job, guys." Paula helped me to my feet, and I stumbled over to the junked remains of the robot, where Jeff was milling through the pile of scrap. : "I wonder what a robot like this was doing in a cave under the Deep Darkness. It's full of weird technology, like that psychic neutralizer. I'm going to take a few of these gadgets with me and study them a little further." Jeff salvaged a few choice pieces of the robot, and we continued. 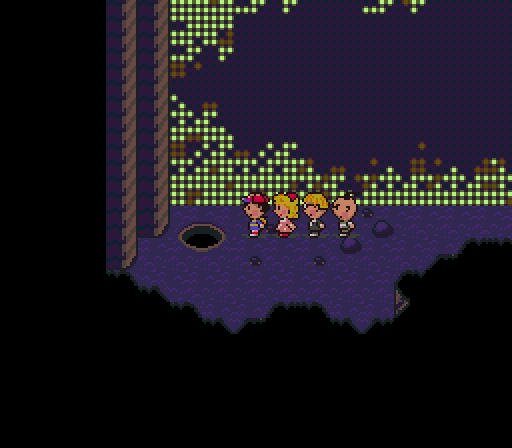 We found another dark hole at the end of the cavern, and slid down it into what seemed like another world. The cave was dark, except for a strange unearthly green glow emanating from the wall. It seemed to pulse lighter and darker with a slow rhythm, like a heartbeat. As we got closer, we saw that the wall was coated with a layer of softly glowing moss. : "Bioluminescent moss! How fascinating." Entranced by the glowing display, we walked on, to a large, open area. Something stopped me here, as the Sound Stone began to thrum in my pocket. One more to go, I thought. 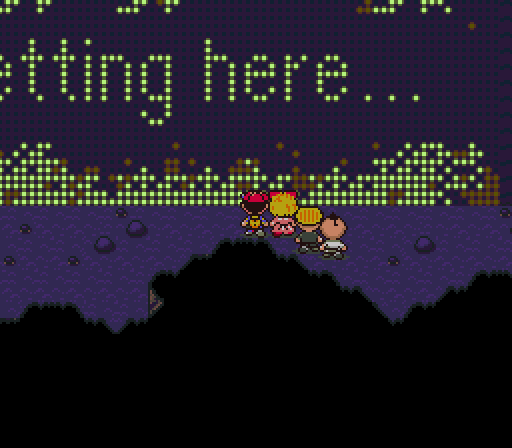 : "-being written out on the wall..."
: "Uh, let's move on...This is strange..."
Up ahead was a large hole, like before. Without thinking, we started to slide down it. Still feeling somewhat strange from the effects of the glowing hallway, I was quickly brought back to reality when we dropped out of the hole and found ourselves freefalling in mid-air, surrounded by clouds, the ground nowhere in sight below us. 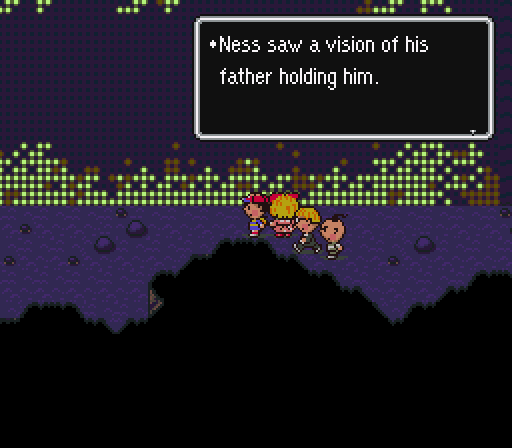 Next time: Ness hits the ground! Don't miss it!